The subset of people who love Marmite and who celebrate Hanukkah must be infinitesimal, so I do not expect a ton of hits on this project. 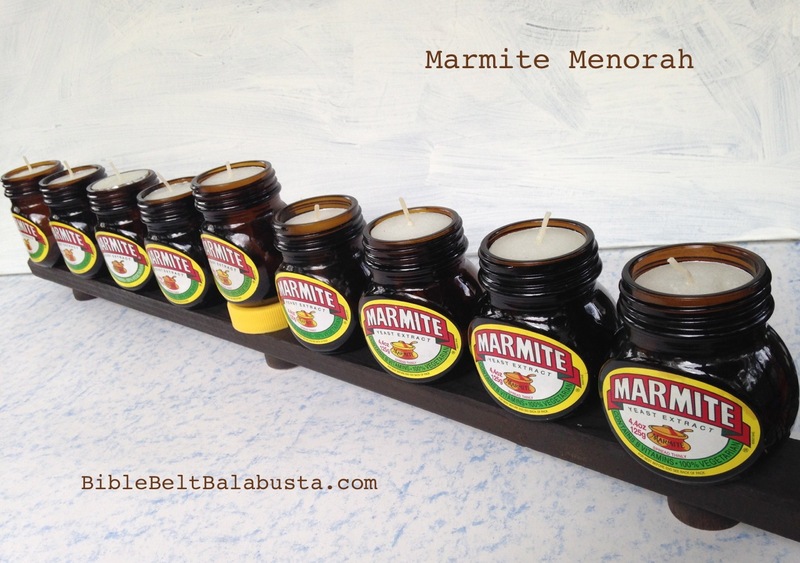 Still, it begged to be created: a Marmite Menorah. Mmmmmm. The name sounds delicious, so warm and yeasty, like Marmite on challah toast. My 6 year-old saw this in the window after school today and declared it a “Men-armite.” (Such a genius.) Whatever the name, I love the look of flames licking up from the open jars, as if by some miracle Marmite is transformed into fire. Marmite is a nutritional yeast spread famed for eliciting love or hate, and my basement proves which side I’m on. I’ve got crates of empties dating back to 1992, including the jumbo and teeny sizes I can only buy in the U.K. One of these days, I’ll figure out what to do with them all. Today, I figured out what to do with 9. And it’s kosher. To eat and to burn. The 4.4 ounce Marmite jars—the only size legally exported to the U.S. from England—are the perfect size to hold a tealight, either the real thing (wax and wick) or LED battery-powered. LED lights for Hanukkah are on my mind this year because I have a kid in college, and naked flames are a no-no in the dorm. 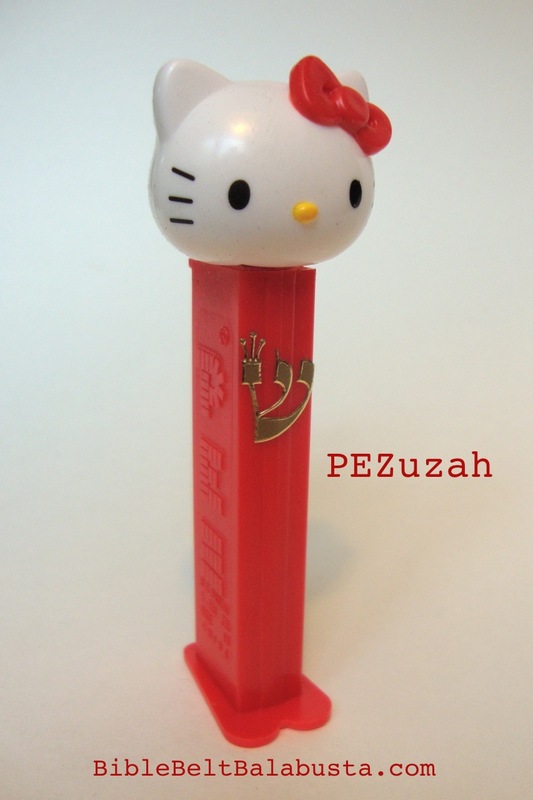 (She will not get this menorah. This one’s for me.) 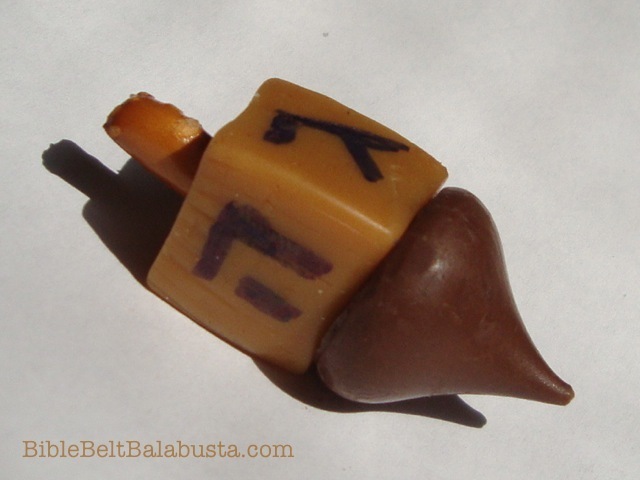 Look for my other flame-less menorahs (coming very, very soon) if you need an uber-safe Hanukkiyah, too. 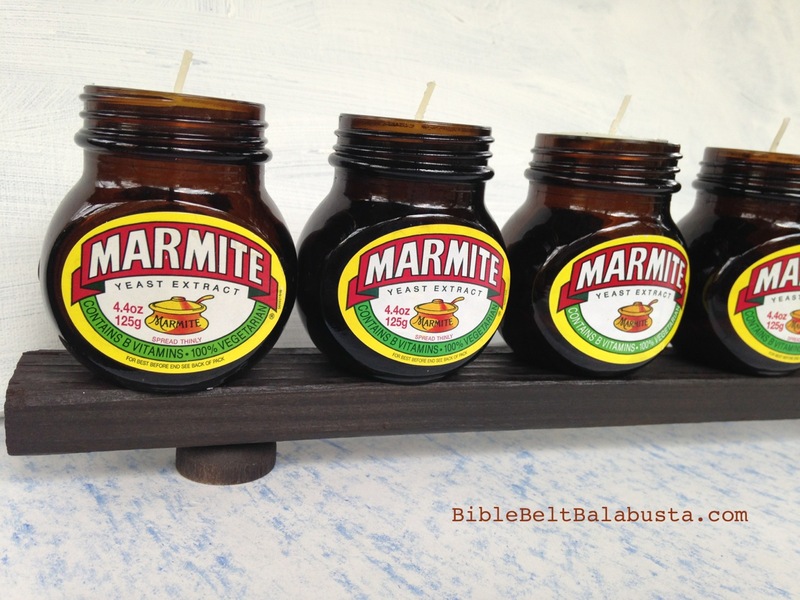 A Marmite Menorah can be as instant as plopping candles inside the mouth of clean, empty jars, or on top of lidded jars. These would be “modular” versions, free-standing and temporary. For a permanent version—recommended if you are wholly committed to Marmite and Hanukkah—you can do what I did: glue empty jars to a 24″ piece of wood trim (painted Marmite brown) and set the Shammash up on its own lid. I added three “wood doll stands” as feet (those doughnut-looking things that clothes-pin dolls are meant to stand up in). The curvy feet echo the roundy-brownness of the iconic jars. Ideally, I should give the whole stand a few coats of high gloss, the better to approximate shiny, sticky Marmite itself. LED: My Dollar Tree LED lights (“Luminessence”) are a perfect fit. Party City brand and Michaels Crafts brands are both a teensy bit too small. These latter two could each be wrapped in a bit of plumber’s Teflon tape to make them thicker and less slick. Or, wrapped with a rubber band. Or, you can wad up foil on the inside of each jar and smoosh it level with the tealight on top. WAX: Real wax tealights fit, as per my pics, but the Dollar Tree kind (“Luminessence”) are just barely too small to sit inside the jar mouth without support. See the foil and wrapping tricks in the previous paragraph. The brand I used for mine are fine, but they hail from an ancient Walmart bag (“Mainstays”) and who knows if they are still manufactured to the same dimensions? Love Marmite and Hanukkah? See last year’s tribute: my Tangram Dreidel Toast. 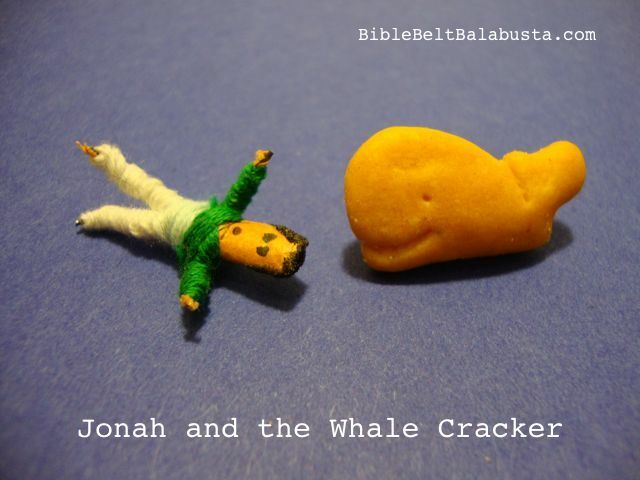 Click here to find LEGO versions, the Swim Noodle, a PVC put-together/take apart kit for kids, a Menurky, a Stegasaur (Menorah-Saurus), Meatloaf menorah, Edible Menorah in the Window, Distributor Cap Menorah and more. SAFETY FIRST: Never leave any lit menorah unattended. Always place a menorah on a nonflammable surface to catch any stray drips or fallen candles. 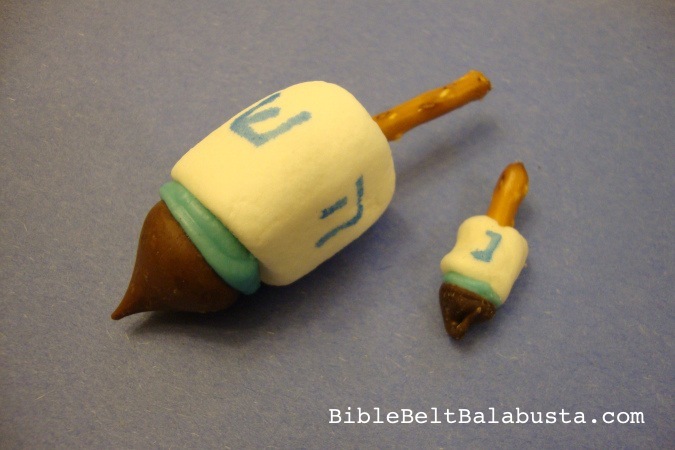 If you are concerned about the safety of this or any menorah I’ve written about, do not make or use it. 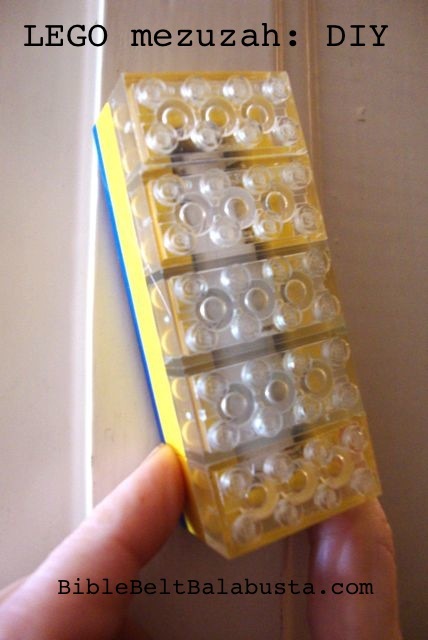 Try an LED tealight version (here and here) or flameless LEGO versions instead! This entry was posted in Crafts, Hanukkah, Kitsch and tagged Marmite, menorah. Bookmark the permalink. Greetings from the UK! 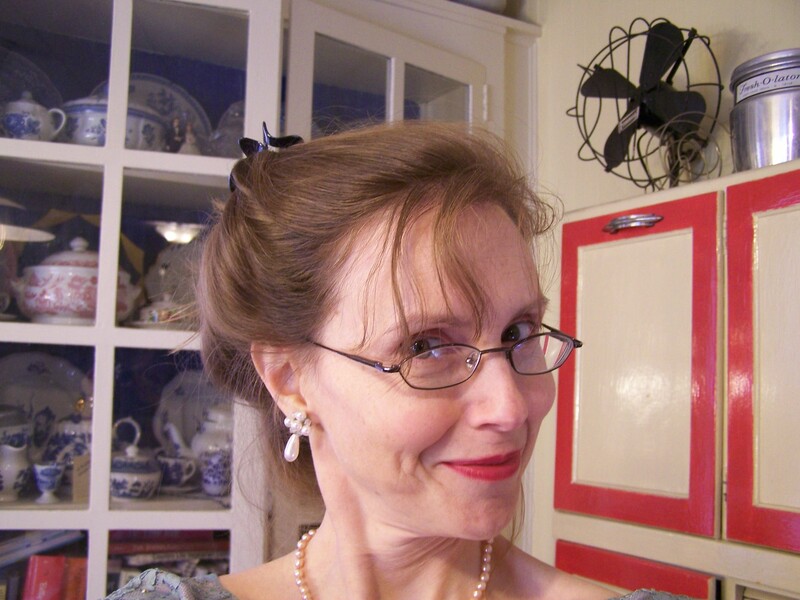 I was born a Gentile but married a Jewish convert and I now embrace the ways of the People as best I can. I’m still learning but your website is helping me a lot in paving the way for when I too am ready to convert. And your crafts aren’t just good fun for children! Adults enjoy them too! 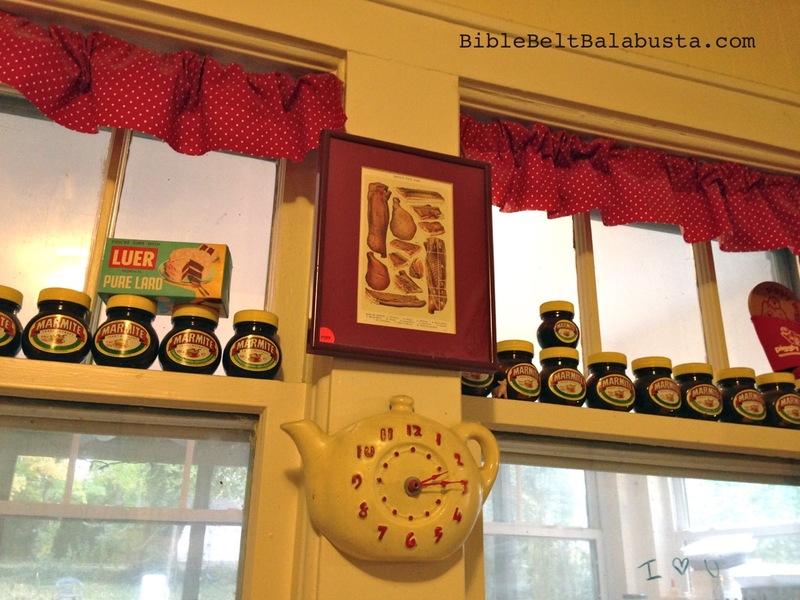 My husband and I both adore Marmite. Cannot get enough of it. For Hanukkah 2014, our Hanukkiyah was made from beer bottles (we’re both real ale fans). For 2015, I’m definitely doing one of these. I’ve already started collecting the jars. I have kept our beer bottle Hanukkiyah, though, along with a Star of David I made from wire coat hangers. Ideally we will manage to have one in every window to publicise the miracle. Thanks, Nicola! You totally get it, that kids should not have ALL the fun. So glad you’re finding neat things to do here. 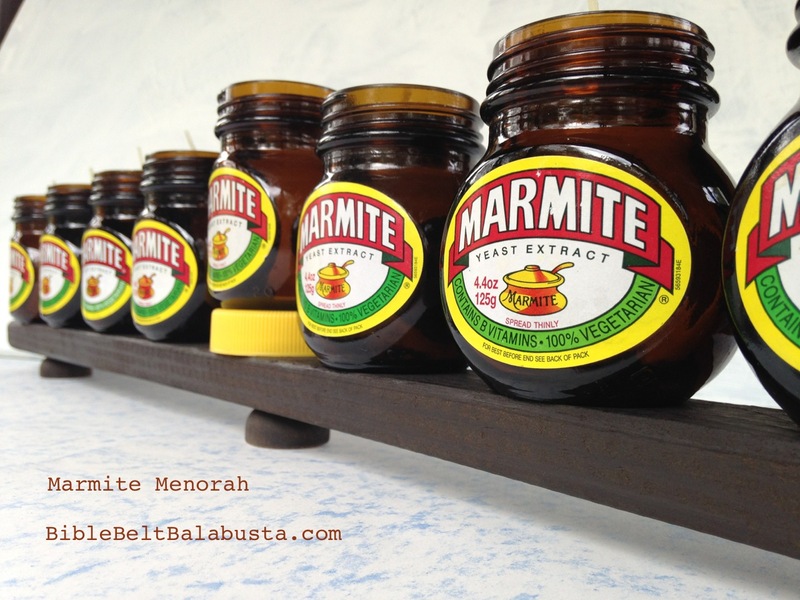 And please share a picture of your finished Marmite Menorah on my facebook page so we can all see it. 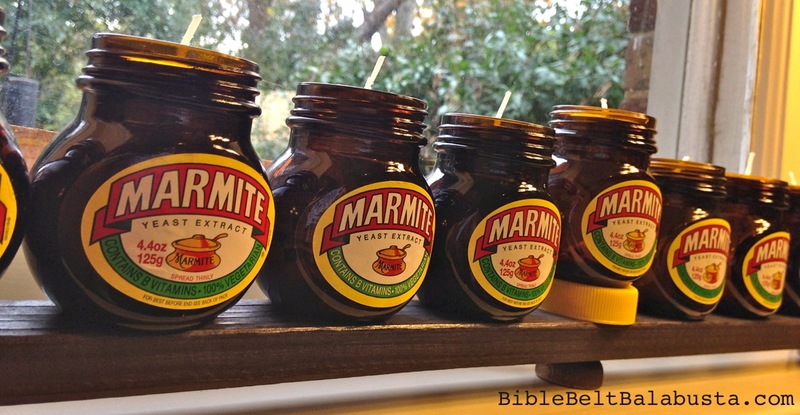 We Marmite folk have to publicize that miracle, too: the marvelousness of Marmite.